No, I did not get that wrong. In Miss Frick’s day Ms. did not exist and, anyhow, I would have been scared to address her as such. I had not been in the business that long and exactly why I was allowed to take care of Miss Frick shortly after I started I am not sure. But then people had favorites some preferred to deal with me , the younger Stiebel, and others with my father, the old world gentleman. Helen Clay Frick (1888-1984) was the third child of Henry Clay Frick (1849-1919), the Pittsburgh Steel Magnate, who built the Fifth Avenue Mansion and its fine collections. Miss Frick took her role as his daughter extremely seriously. I must be clear that I knew Miss Frick, only as a client, between 1968 until she moved back to Clayton the family home in Pittsburg a bit more than a decade later. We all see people from our own point of view and from mine Miss Frick was an independent soul who knew what she wanted and a spunky doyenne. She never built as great a collection as her father but she had wonderful taste and when she no longer approved of the way things were run at the Frick Collection in New York she decided to open the Frick Museum in Pittsburgh. It was for this project that she came into my family gallery. She arrived at the gallery one day ostensibly looking for a specific piece of furniture but she eventually ended up in our last show room with its red velvet walls in which we showed paintings. In those days an art handler would bring each painting or drawing in separately to display on our red velvet easels. 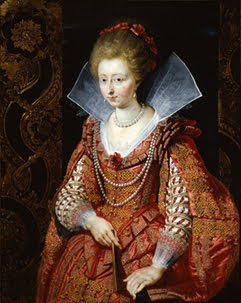 On this particular day we had had a visitor just prior to Miss Frick and a portrait by Sir Peter Paul Rubens (1577-1640) of Eléonore de Bourbon (1587-1619) had been left on the easel. In the same room were showcases which were opened to reveal medieval and renaissance treasures and Ms. Frick had been headed for them. When she saw the Rubens, however, she asked a few questions and bought it on the spot! Boy, were we surprised but then Miss Frick did not need a decorator or an art advisor to tell her what she liked. Another time, in the room before the red velvet one she spotted a two tiered round table known as a gueridon. It was an extremely fine piece stamped M. Carlin, one of the best Louis XVI cabinet makers. The top was a Sèvres plaque of the period and coming out of the porcelain top was a gilded bronze candle holder for 2 candles. This table represented the best of its type that existed. 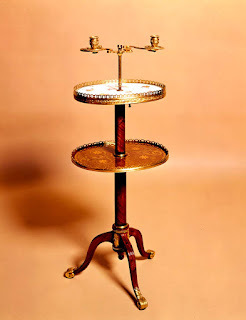 In fact, I can remember few that were as good as this gueridon. She took one look at the table and said, “Mr. Stiebel, if you can find me the candles that fit into those candleholders I will buy the table. Now with some people who say things like that one might laugh. The difference here was she was dead serious! Some months later my wife and I were on holiday in New Hope, Pennsylvania antiquing (not for the gallery but for stuff at home). I spotted a candle maker’s shop and we stopped in. There I saw some short white candles that I thought might fit and laughing bought them. I was quite unsure either whether they would fit or if Miss Frick would remember but the investment was a not major!. Back in New York the candles fit perfectly so I phoned Miss Frick ANDS She said, “In that case, Mr. Stiebel, I will buy the table”. There was never any discussion about price or discounts. She either bought something or did not. Finally, one other sale sticks in my mind. Miss Frick lived for many years in an apartment over the Frick Art Reference Library. In fact, until her death the story went, she insisted that in the library all women wear skirts and all men wear jackets, no matter the stifling heat without air conditioning in the summer. 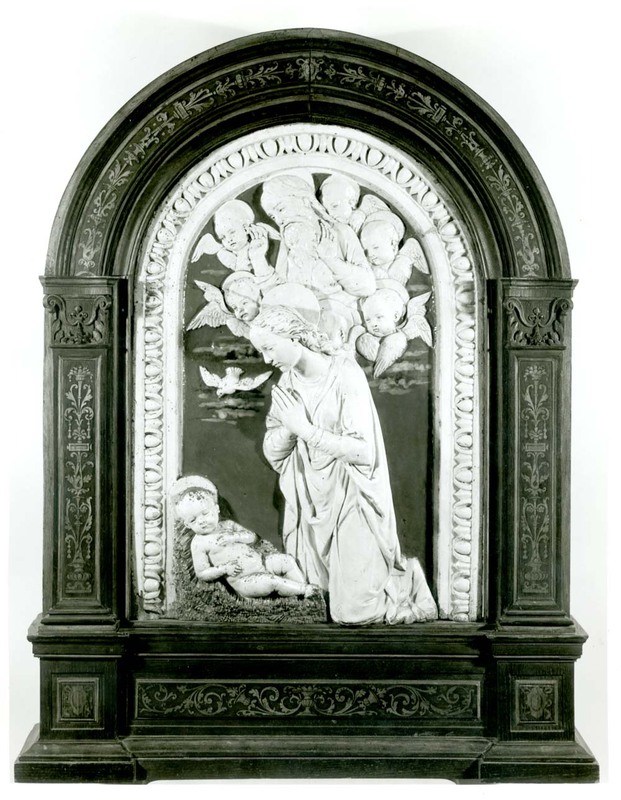 When one got off the elevator on the main library floor on the opposite wall there was a lunette by one of the Della Robbia brothers and Miss Frick asked me to find another that she could put in the Pittsburgh Frick. As luck would have it I found one almost immediately very close in size and it had belonged to the Vanderbilts in their house at the Breakers in Newport. I was most excited having found just what she wanted with a great provenance. But she turned it down and I was mystified. The religious subject was similar, it was the right form, it was just perfect. Finally, in frustration, I phoned her long time secretary, Mrs. Egan, and said that I did not know where to look if she turned down the one I had found and could she possibly enlighten me. “Well, Mr. Stiebel” she said. “frankly, Miss Frick is not going to buy anything that comes from the Vanderbilts”! I am sure therein lies another wonderful story. Eventually, I found Miss Frick another della Robbia which had been de-accessioned from the Metropolitan Museum. It was not quite the same shape and possibly not as important, but she bought it. The price was $48,000 and Miss Frick said that she was afraid that she could only pay us $5,000 a month. This was most unusual and seemed very strange, but, of course, we said that we would accept her terms. What we did not know was that Mr. Cooley, her financial person, was away at the time and only on his return did he learn of Miss Frick’s arrangement. He phoned and apologizing said, “Mr. Stiebel, I think we can do better than that” Within the week we received a check for the full amount. If the art business were only so simple today, collectors who know their own minds and have confidence both in themselves and the dealers that they visit.